NASHVILLE, Tenn. (AP) — Phil Bredesen is a Democrat. But he’d rather you not mention that. “I need to make clear to everybody my independence from all of the national Democratic stuff,” said Bredesen, the former two-term governor of Tennessee who is now running for the U.S. Senate. So far, his strategy appears to be working. According to internal polling by both parties, Bredesen has a narrow lead over Republican Rep. Marsha Blackburn in a state that President Donald Trump won by 26 points, and capturing the open seat would strengthen Democrats’ chances of taking back control of the Senate in the November elections. Bredesen, a 74-year-old white man, is an unlikely vessel for the hopes of a national party increasingly reliant on younger voters, women and minorities — and nominating more candidates that fit that same profile. He says Democrats wouldn’t be able to reliably count on his vote in the Senate, and foresees playing a role like that of Maine Sen. Susan Collins, who has broken with the GOP on several high-profile issues. “I think you can be influential being in that swing position,” Bredesen said during an interview this past week in his campaign office in Nashville’s West End neighborhood. Bredesen represents the irony facing Democrats this fall. The party is moving to the left but its prospects of regaining the Senate hinge on decidedly moderate candidates running in states Trump carried by a wide margin. 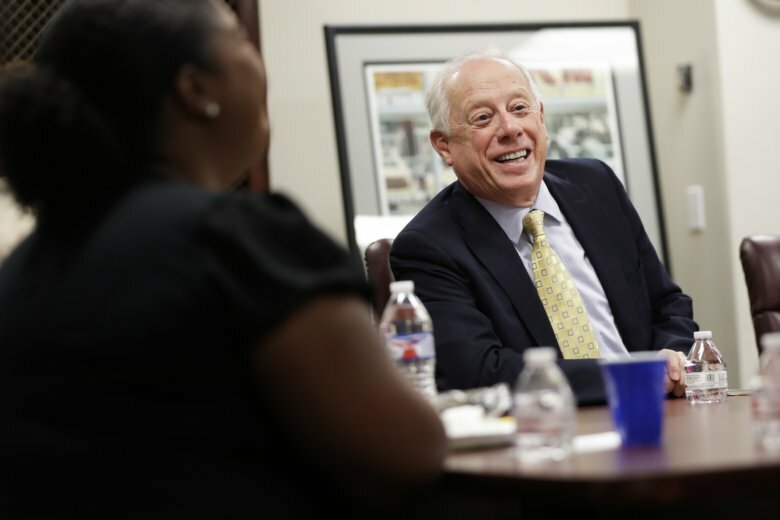 With just over six weeks until Election Day, one of Bredesen’s biggest challenges may be divorcing his race from Democrats’ overall Senate chances. Democratic incumbents in Indiana, Missouri, West Virginia and North Dakota are facing a similar challenge as they try to hold on. In Arizona, Democratic Rep. Kyrsten Sinema hopes to win a Senate seat by positioning herself as a centrist, despite starting her career as a Green Party activist. Among this group of Democrats, Bredesen has been the most overt in distancing himself from his own party. He pans Democratic leaders for being “elitist” and bemoans efforts to win elections through “demographic partitioning.” While he’s consistently favored allowing access to abortion during his political career, he speaks openly about how that is not a defining issue for him. That’s why Blackburn is trying at every turn to remind voters of the “D” that will be next to Bredesen’s name on the ballot. The key for Bredesen, who earned millions as a health care executive before going into politics, is nostalgia. He’s banking on voters looking back fondly on the 16 years he spent as Nashville mayor and then Tennessee’s governor. Signs in his campaign office remind volunteers to cite accomplishments such as bringing professional football and hockey to Nashville and stabilizing the state’s Medicaid expansion program. For Bredesen to win, he’ll need to both ramp up Democratic turnout and peel off moderates such as Whitley, who may endorse Trump’s policies but are seeking a check on some of the president’s worst impulses. Democrats acknowledge it’s difficult to see how a nominee without Bredesen’s track record in the state would be competitive in 2018. Tennessee has shifted further to the right since Bredesen left the governor’s mansion in 2011. And it’s unclear whether Republican Sen. Bob Corker, whose retirement has opened up the Senate seat, could have won a GOP primary given his frequent criticism of the president. Indeed, Bredesen’s strength has left Republican Party officials anxious. Despite being a tea party favorite and frequent Fox News guest, Blackburn isn’t as well-known in Tennessee as her Democratic opponent. Focus groups through the summer showed some voters confused her with another Tennessee Republican, Rep. Diane Black, who lost her bid for the GOP nomination for governor. To close the gap with Bredesen, Blackburn is leaning hard on her close ties to the president. She recently ran a television ad featuring Trump’s appearance for her at a rally in which he said, “Phil, whatever the hell his name is, this guy will 100 percent vote against us every single time.” Vice President Mike Pence campaigned for Blackburn on Friday. Blackburn’s campaign is also trying to pressure Bredesen to say whether he would vote for Brett Kavanaugh, Trump’s embattled nominee for the Supreme Court. Bredesen has spoken favorably about Kavanaugh’s experience, and political operatives in Tennessee believe he was preparing to announce his support for the judge before Kavanaugh was accused of sexual assault. Blackburn sidestepped questions about whether she believes Ford’s allegations are credible or disqualifying for Kavanaugh if true. “If I were in the Senate at this point, I would listen to her testimony, receive that testimony and make a decision if I felt like the allegations were true and valid,” she said of Ford. Blackburn’s campaign and the White House have discussed the president making another stop for her in Tennessee before the Nov. 6 election to help give the congresswoman a boost and energize Republican voters. Bredesen, meanwhile, hasn’t had any national Democratic stars publicly campaigning for him — nor does he want them.